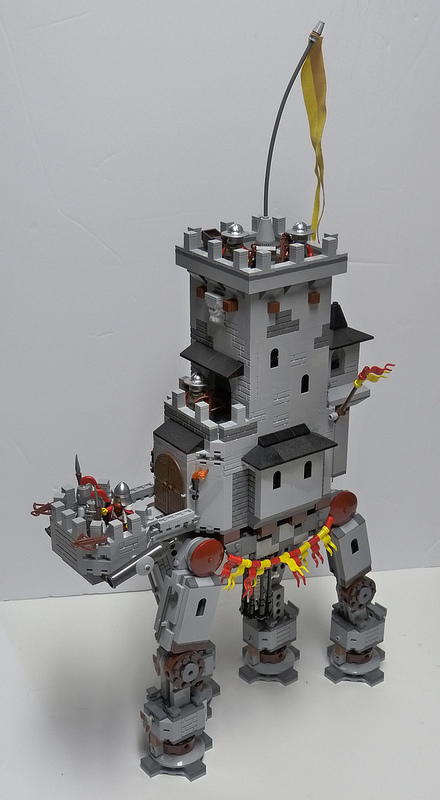 This cracking Castle-themed AT-AT build by Adam Dodge properly made me chuckle. This wouldn’t be a bad little Castle tower, even without the legs. There’s a nice variety of greys, textured bricks, and jutting roofs to break up the walls. But plonk said tower on top of a set of medieval AT-AT legs, and you’ve got a really fun build. I like the cannons mounted on the side of the “head”, and those flags and line of bunting add a welcome splash of color. There’s even a skeleton hanging in a cage beneath the beast’s belly! If I had one suggestion for improving this, it would be to change those radar dish elements at the hips. They’re too smooth for my liking. I’d have liked to see something a bit craggier, maybe some big cogs, suggesting hefty medieval machinery at work. However, that’s nitpicking – a minor niggle in an otherwise great model. I’d like to see this creation in a mechanical battle to the death with one of my own models – this Troll AT-AT from a few years ago. Bring it on Adam! Your Crownies are going down! Bringing a little “early” Titan Technology to the Star Wars universe from the Warhammer universe?